While Obama administration officials and the U.S. African Command (AFRICOM) representatives insist that U.S. foreign policy towards Africa isn\’t being militarized, the evidence seems to suggest otherwise. While Africans condemned U.S. military policy in Africa under the Bush administration, the Obama administration has not only mirrored Bush\’s approach, but has in fact enhanced it. President George W. Bush established Africa as a foreign policy priority in 2003, when he announced that 25% of oil imported to the United States should come from Africa. 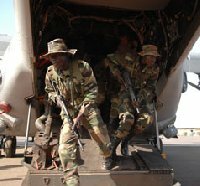 Like the Cold War, the Global War on Terror establishes a rationale for bolstering U.S. military presence and support in Africa. Yet official pronouncement of U.S. policy is routinely presented as if neither of these two developments occurred. Unfortunately, the more evasive we are about our intentions on the continent, the more we invite not only skepticism, but even resistance. A policy is militarized when military might is deemed the only effective way to accomplish its agenda. In a June statement on U.S. policy in Africa, U.S. Assistant Secretary for African Affairs Johnny Carson said the agenda of the Obama administration is as follows: promoting and strengthening democracy and the rule of law, preventing and mitigating conflicts, encouraging sustained economic development and long-term growth, and working with African countries to face both old and new global challenges. The agenda makes no reference to the recent FY2010 budget that doubles the size of AFRICOM\’s funds. Nor does it mention the doubling of financial support for counterterrorism projects throughout the continent — including increasing funds for weapons, military training, and education at a time when U.S. foreign aid money is stagnating. AFRICOM has been controversial on the continent since President Bush first announced it in February 2007. The Bush administration discussed several sites for its headquarters, but their failure to include African civil society in the discussion is widely regarded as a major mistake. Though the Western press barely reported it, the reaction on the continent was vociferous. Every country with the exception of Liberia rejected AFRICOM, and African civil society, where allowed to speak, has overwhelmingly characterized AFRICOM as a means to secure oil and nothing more. Officials in both the Bush and Obama administrations argue that a major objective of AFRICOM is to \”professionalize\” security forces in key countries across the continent. However, they don\’t attempt to address the impact of this on minority parties or whether the U.S. is effectively propping up \”friendly\” dictators. These are key questions that need answering if our agenda includes democracy and rule of law. Training and weapons programs and arms transfers for Equatorial Guinea, Chad, Ethiopia and even the beleaguered Transitional Federal Government in Somalia, clearly indicate that using the military to maintain influence in government in Africa remains the priority the foreign policy goal. The U.S. fascination with oil, the war on terrorism, and the military is further exemplified through the announcement that on July 12, Obama will visit Africa for the first time. The president has chosen Ghana as his only African destination this trip. The U.S. government itself states the purpose of the visit is \”strengthening the U.S. relationship with one of our most trusted partners in sub-Saharan Africa, and to highlight the critical role that sound governance and civil society play in promoting lasting development.\” Indeed, Ghana\’s extraordinarily consistent economic growth pattern for the past seven years (registering a GDP expansion of 7.3% in 2008) offers the best evidence of the relationship between government accountability and economic development. On top of that, on January 3rd 2009, John Atta Mills defeated Nana Akufo-Addo by less than 1% in the Ghanaian presidential election. Most believe that the election was by and large free and fair, and the transition was for the most part peaceful. There is much to be proud of in Ghana, and the burgeoning success story there is most welcome. However, there are rumblings that the real reason the administration chose Ghana is two-fold: Ghana\’s discovery of oil in 2008, and perhaps more importantly, the geographically, economically, and politically strategic advantage of establishing AFRICOM\’s headquarters there. These questions arise because it would be hard for Africans not to conclude that security and energy concerns under the protection and guidance of AFRICOM are driving our foreign policy, as opposed to those articulated by Carson. If this isn\’t the case, then the United States is failing to make clear how dramatic increases in U.S. investment in weapons financing and military training for countries, regardless of their records on human rights or democracy, are ultimately going to help us achieve the agenda.